While Pius Heinz and Sam Holden keep all of their World Series of Poker (WSOP) winnings, the others will have to pay a huge amount to taxes. Ben Lamb and Eoghan O'Dea are the biggest losers. 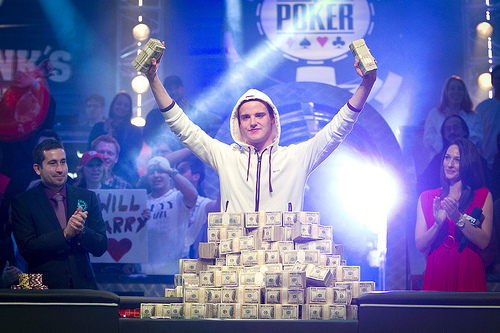 According to the German-American agreement on taxes, the newest poker world champion, Pius Heinz can keep all his WSOP Main Event winnings of $8,715,638 withouth having to pay any taxes. This agreement states that he doesn't have to pay taxes in the USA as a German citizen, neither he has to in his hometown, Vienna, Austria. The Czech Martin Staszko won $5,433,086, which, according to the Czech-American agreement, he doesn't have to pay in the States, however, he has to in the Czech Republic. He has to pay 15% of his winnings, which is $814,963, a quite nice sum. The biggest loser in this taxation case is the WSOP Main Event's 3rd place, Ben Lamb. He took home $4,021,038, from which he will pay $1,524,011 to taxes, plus he will have to pay $241,268 to Oklahoma state. The second biggest loser is the 6th place finisher Eoghan O'Dea. The Irish player won $1,720,396, which is tax-free in the United States, but he has to pay an enormous amount according to Irish rules. They state that professional poker players (amateur player's winnings are tax-free) have to pay 20% taxes after the first €36,400 won, any winning above that entails a 41% tax. O'Dea's tax is therefore $695,018.